Preparations are underway for a very special garden, arriving in Chester this week. As part of ’Cheshire’s Year of Gardens 08’ a unique Cheshire Floating Garden Festival moors in Chester on June 7 and 8. ‘Shad’ (a motor narrow boat, built in 1936) will be carrying a specially created ‘Made in Cheshire Garden’ designed by artist Christine Wilcox-Baker. ‘Gifford’ (originally built as a horsedrawn tank boat in 1926) will accompany Shad from the National Waterways Museum Ellesmere Port on Friday 6 June. Christine joined the crews of Shad and Gifford this week, as work started on the grand design. Shad sails from the National Waterways Museum Ellesmere Port to Chester on Friday 6 June, following a blessing at 1.30pm, the boats will be moored at the Canal Basin opposite Telfords Warehouse between 10am and 4.30pm on Saturday 7 June and at Cow Lane Bridge opposite the Frog & Nightingale on Sunday 8 June. On Saturday 7, the Boats will be welcomed by The Lord Mayor of Chester Cllr Brian Bailey at 11am. Chester’s newest website Screenchester.co.uk will be filming throughout the day, visitors are invited to come along and share their memories of Chester and past events they have enjoyed. Visitors will also have a chance to discover the Chester Inigma art project and also meet artists from the Cheshire Artists Network. There will also be guided walking tours of the Canal Basin leaving on both days at 2pm from the floating garden. The tours can be pre-booked from the Town Hall Tourist information centre (£5 adult £4 concessions £13 Family). Shad and Gifford can be seen navigating the Northgate Locks from 4.30pm as they head for Cow Lane Bridge. 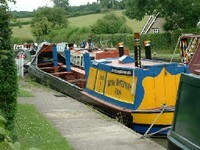 The boats continue to Great Boughton and Christleton on Monday 9 and head for Beeston on Tuesday 10. A variety of activities and school visits have been arranged during the expedition. There will be a final chance to enjoy the floating Garden when it returns to Ellesmere port Boats in Bloom at the National Waterways Museum Ellesmere Port – Shad and Gifford (and blooms) will be on display on their return to the museum Friday 4 – Sunday 6 July. If you have active acne, wait before starting an acne scar removal treatment.